Jimmy: I was a selfish man who drove my ex-wife away. I was greedy and treated her terribly. When she asked me for money I would leave her whatever I wanted to give. I didn’t listen to her and showed her no respect. In return for all the mistreatment over the years, she left me. Now I was lonely and had no one at all. My failed marriage led me to develop an alcohol and drug dependency that affected me for years. I also wasted my money away on gambling. I was honestly depressed and my love life was the last thing on my agenda. I was terrified of starting a relationship because I truly believed that it would never work out and that it would always be the same old story. I was alone for many years until I came to the UCKG HelpCentre. Even after receiving help to finally quit my addictions, I still couldn’t bring myself to face the issues regarding my love life. I was invited to attend the Love Therapy on Saturdays on many occasions, but I was far from interested. I just couldn’t bring myself to think about my love life yet. One Saturday evening, I was at the Rainbow Theatre and went in out of curiosity – what was meant to be ‘just passing through’ turned out to be one of the best decisions I have made. The Love Therapy meeting was nothing at all like I’d imagined. It was simple, smart and practical! What stood out to me was the way they broke down what I needed to look for in a partner for life. I’d never heard it like this before. But what instigated the change in my love life was the message on how I could change myself and prepare my heart and mind for marriage. 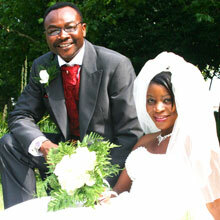 Maria: I was engaged to the man of my dreams and was very much in love. I couldn’t wait to spend the rest of my life with my fiancé. But then, disaster struck when he died. I felt like my whole world had collapsed. He was my everything. I became like the living dead – walking around in a daze not knowing what to do. I didn’t know how to be without him. I just didn’t want to live anymore; it was like he took my heart with him when he died. I made myself the unmarried ‘black sheep’ in my family, and stayed that way for 11 years until I came to UCKG HelpCentre. I was still young, but I didn’t realise that I was using my grief as a shield. A part of me was afraid of loving someone, only to lose them again. I didn’t want to be this way anymore, but I first needed help to work through my grief. The first person I allowed into my heart was God – I needed Him to heal me from within. The messages encouraged me to look to the living and I did. I gave myself time. Months and years passed by until my time had finally come. It was also during the Campaign of Israel at Jacob’s Well. This was my opportunity also. I sacrificed two years worth of my savings; I sold my clothes and shoes in the market to build up my sacrifice. This was the way I found to call God’s attention to my dream. Jimmy: I wrote a letter addressed to God, detailing exactly what I wanted in my future wife. It described the kind of qualities I wanted her to have. I had already imagined what I wanted in a wife. I sacrificed one- month’s wages and I sold my car. I dedicated more time in the church, fasted and prayed in the middle of the night. It wasn’t easy, as I had to now walk to places. My car was my form of transport. Jimmy: The most important aspects of our marriage are communication; to know what each other is thinking or going through all the time; humbleness to recognise our mistakes when we are wrong and put them right and respect and care for each other. I can truly say that my wife is my best friend. I am so fond of her and she is so humble and understanding. I trust her very much. Our marriage is an extraordinary gift from God. She was depressed and I was a drunk, drug-taking gambler. Love was the last thing on our minds, but today we are inseparable. The extraordinary dream we had became a reality in our lives.